Purpose: The aim of the study is to study the feasibility of gamma-ray-detection-based precision dose measurement of 125I seed brachytherapy in solid water. Materials and Methods: Seven group 125I seeds with different activities were put into a hole in the center of solid water individually. Each group had ten seeds, and the seed activity ranged from 1.48 × 107 Bq to 3.7 × 107 Bq. Single-photon emission computed tomography/computed tomography (SPECT/CT) was used to scan the seeds perpendicular to the long axis of the seed, with a slice thickness of 3.75 mm. 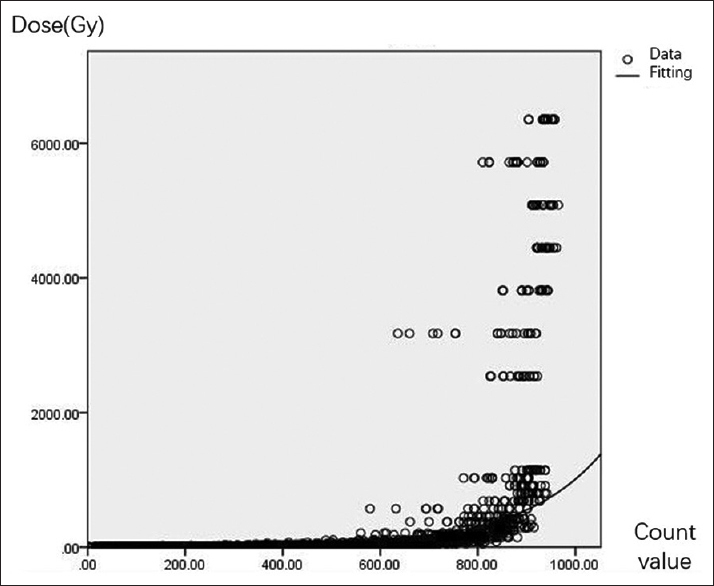 The radioactive count values (x) of the radioactive concentration around the seeds were collected at a distance of 1–15 mm from the center of the seeds, while the corresponding doses (Y) (Gy) were calculated. SPSS 18.0 was used to analyze the relationship between the count value and the dose. Results: With the same seed activity, the count values became smaller according to the distance from the center of the seeds. The count values at the same point had an increasing trend according to the activity. This is similar to the doses calculated at the same point. There was an exponential relationship between the dose around the 125I seeds, and the radioactive count value detected by SPECT/CT. Correlative curves between the dose and radioactive count value detected by SPECT/CT of different-activity 125I seeds were fitted. The formulas of the dose and radioactive count with different seed activity were in the form of Y = b0 (b1)x. The constant b0 ranged from 1.48 to 3.93, according to the seed activity, while b1 was 1.006 for every seed's activity. Conclusion: The count value around the 125I seed can be detected accurately by SPECT/CT, and then can be quantified. This study provided useful experiment data for the precision measurement of 125I seed implantation. Radiation detection-based dose measurement may become a new noninvasive technology for the dynamic dosimetry verification method after brachytherapy. 125I seed brachytherapy is widely used in tumor treatment, particularly for prostate cancer. As a first-line treatment, brachytherapy has been recommended by the National Comprehensive Cancer Network guidelines for many years. Due to the excellent outcomes achieved in prostate cancer, brachytherapy was used widely in many other tumors during the past decade.,,,, As brachytherapy is a kind of radiotherapy, the therapeutic effects and complications were related to the dose of the target and the organ at risk. Because of the importance of dose-volume quantifiers, the current practice guidelines issued by the American Association of Physicists in Medicine (AAPM) recommend that postimplant dosimetry should be performed for all patients. Posttreatment dosimetry is used to confirm the dose delivered to the prostate as well as evaluate the dosimetry to the organ at risk. The standard way to calculate dose, and evaluate dose distribution was computed based on a postoperative plan according to the American Brachytherapy Society Guidelines. The most common way to perform the postimplant dosimetry is image-based calculation with a treatment planning system (TPS). Using TPS can calculate the dose more quickly and accurately than manually or with a nomograph, but disadvantages do exist. Only by knowing the seed number and activity can the dose be calculated in an image-based postoperative plan. At the same time, there are some other drawbacks such as difficulty in identifying seeds in TPS, errors in the seed number, activity inaccuracy, seed location identification imprecision, and artificial errors. Techniques using computed tomography (CT) for seed detection showed an interobserver variability in D90 and V100., The presented preliminary dosimetric results indicated that artifacts and incorrect seed localization can lead to large discrepancies.,, With CT-based postoperative dose verification, missing seeds and their locations are difficult to identify, which leads to a larger dose error. The best way to solve this error is to use a dosimeter to measure the dose instead of dose calculations. However, dosimeters such as thermoluminescent dosimeters and optically stimulated luminescence dosimeters can only measure the point dose. A film dosimeter can measure a relative two-dimensional dose, but it cannot be used in vivo. An ionization chamber has a high accuracy but is too large for 125I seed dose distribution measurement. Some other dosimeters such as area survey meters and personal dosimeters can detect γ-rays sensitively, but they have low accuracy. Even if the dosimeter can measure the dose, it is difficult to identify the relationship between the dose and the anatomy of the patient. If the γ-ray of a 125I seed in the tumor can be detected accurately on the surface of the patient, and the dose distribution can be reconstructed in the tumor area, this will resolve all the concerns above. To solve these problems and provide a more accurate and easier way to verify the dose, single-photon emission Computed Tomography/Computed Tomography (SPECT/CT) was used in this study. SPECT is a nuclear medicine tomographic imaging technique to detect γ-rays. It has one to three gamma cameras that can detect the count value of γ-rays emitted by radioisotopes. This count value can be freely imaged, reformatted, or manipulated as required. The technique was used for identifying biologic target volumes in prostate brachytherapy, bone metastasis diagnoses, and monitoring the localization and migration of 125I seeds.,, However, the research studies about the relationship between the dose and count value have been scarce. In fact, the count value of the radioactivity concentration can be measured accurately with SPECT/CT. If the relationship between the count value and dose can be revealed, it will be useful for dose verification in brachytherapy with SPECT/CT. Our previous publications found the relationship between the count value and the dose for the first time. The count value was sensitive according to the different doses. However, only six seeds were scanned, and the result was not accurate enough. In this study, 70 seeds with different activities were scanned by SPECT/CT, and more data were analyzed. More accurate relationships between the count values were detected, and the doses around the seeds were reported. This may provide a theoretical foundation for developing a new way to accurately verify the dose postoperatively. A radioactivity meter (CURIEMENTOR® 3 Isotope Calibrator, PTW, Germany) was used to measure the activity of radioactive 125I seeds (model 6711-99, activity 1.48 × 107–3.7 × 107 Bq, length 4.5 mm, diameter 0.8 mm, average energy: 27–35 Kev, Beijing Zhibo Pharmaceutical Company) before detection. The activity was 1.48 × 107 Bq, 1.85 × 107 Bq, 2.22 × 107 Bq, 2.59 × 107 Bq, 2.96 × 107 Bq, 3.33 × 107 Bq, and 3.7 × 107 Bq. Each activity had ten seeds. Five RW3 polystyrene solid water phantoms from PTW Freiburg Germany were selected. The side length of the phantoms was 30 cm and the thickness was 5 cm. The chemical composition and physical parameters of the phantom is listed in [Table 1]. A hole with a depth of 4.5 mm and diameter of 0.8 mm for the seed was drilled in the center of one of the phantoms. A total of seventy 125I seeds were placed into the hole of solid water individually. Two solid water were next to the one with the hole on both sides. The air was pressed away from the space among the phantoms. The phantoms with seeds were located on the couch of the SPECT/CT (Discovery NM/CT 670, GE company American) perpendicularly. A laser line was used to make sure, the phantoms were completely perpendicular to the ground and the couch's long axis. SPECT was used to scan the phantoms perpendicular to the axis of the seed. The parameters of the scanning are listed below. A low-energy and high-resolution-type collimator was used in H mode, where two detectors detected 360°, every detector was 180°, every 6° was one frame, and one frame was 10 s; further, the isocenter was rotated. The scan radius was 29.6 cm, the matrix density was 256 × 256, the energy level was 35.5 Kev, and the energy window width was 30%. The γ-rays emitted from the seeds were detected by the SPECT and formed an image. After that, a CT scan was performed by the same machine with a slice thickness of 3.75 mm. A Xeleris 3 Functional Imaging Workstation was used to fuse the image of the CT and SPECT. The seed on the CT image was adjusted into the center of the SPECT image. The radioactive count values (x) were collected at a distance of 1–15 mm from the center of the seeds. 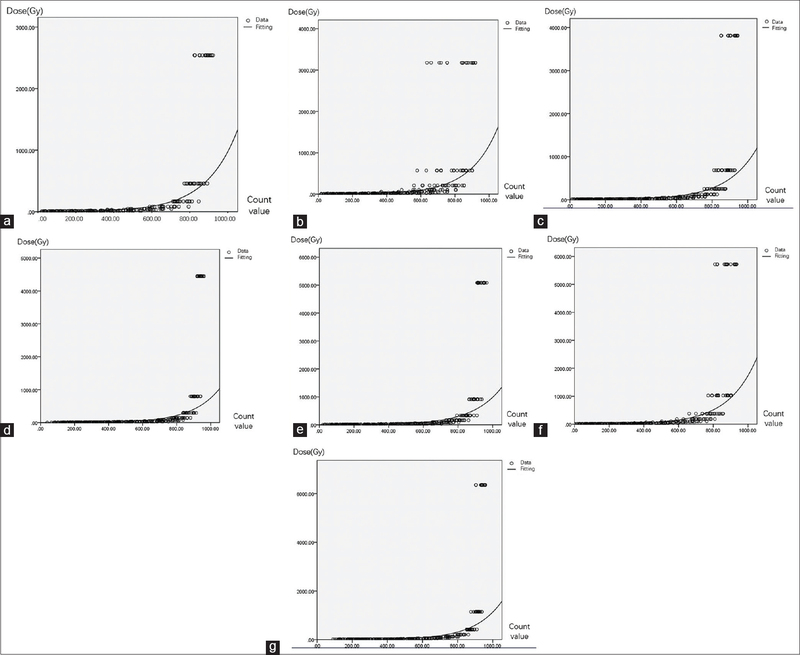 The fusion images of the 3.7 × 107 Bq seed with 100, 200, 300, 400, 500, and 600 count value areas are shown in [Figure 1]. According to AAPM TG-43, the formula D = 1.44 × SK× Λ × (1/R2) × g (r) × Φan× T1/2 was used to calculate the dose at 1–15 mm from the center of different-activity seeds. T1/2 is the half-life in hours of the radioactive seeds, equal to 1425.6 h.
The dose and count values at the same point of the same seed were related. SPSS version 13.0 statistical software (IBM, Armonk, NY USA) was used to calculate the equation and the correlative curve. First, all count values and doses of the 70 seeds were related. The correlative equations and curves were calculated. Second, the correlative equation and curve were calculated for every seed group with the same activity. [Table 2] shows the count values detected by SPECT/CT. In groups with equal seed activity, the count values become smaller according to the distance from the center of the seeds. When the distance is longer than 15 mm, the count values are close to background radiation and are not collected. In groups with different seed activity, the count values at the same point have a trend of increasing according to the activity. The doses of points 1–15 mm from the seed centers as calculated are listed in [Table 3]. The inverse-square law is followed for the doses calculated according to the distance. When the distance was longer than 15 mm, the doses with every activity in this study were very low. This is similar to the count values detected by the SPECT. The doses at the same point increase according to the activity. Correlative curves between the dose and radioactive count value detected by SPECT/CT of different-activity 125I seeds are shown below. All of these formulas for the dose and radioactive count with different seed activity are in the form of Y = b0 (b1)x. Although b0 is different in the formula with different seed activity, b1 is the same in all formulas. Correlative formulas between the dose and radioactive count value detected by SPECT/CT of every activity of 125I seeds are shown below. The activities were 1.48 × 107 Bq, 1.85 × 107 Bq, 2.22 × 107 Bq, 2.59 × 107 Bq, 2.96 × 107 Bq, 3.33 × 107, and 3.7 × 107 Bq. All of these formulas with any activity are in the form of Y = b0 (b1)x. The constant b0 ranges from 1.48 to 3.93, according to the seed activity, while b1 is 1.006 for every seed activity. The correlative equation of 1.48 × 107 Bq seeds was Y = 2.442 × 1.006x, R2 = 0.833, F = 940.962, P = 0.000 < 0.01, and is statistically significant. The correlative equation of 1.85 × 107 Bq seeds was Y = 2.460 × 1.006x, R2 = 0.780, F = 962.92, P = 0.000 < 0.01, and is statistically significant. The correlative equation of 2.22 × 107 Bq seeds was Y = 2.361 × 1.006x, R2 = 0.849, F = 1652.161, P = 0.000 < 0.01, and is statistically significant. The correlative equation of 2.59 × 107 Bq seeds was Y = 1.586 × 1.006x, R2 = 0.821, F = 1370.657, P = 0.000 < 0.01, and is statistically significant. The correlative equation of 2.96 × 107 Bq seeds was Y = 2.657 × 1.006x, R2 = 0.839, F = 1529.475, P = 0.000 < 0.01, and is statistically significant. The correlative equation of 3.33 × 107 Bq seeds was Y = 3.929 × 1.006x, R2 = 0.855, F = 1706.184, P = 0.000 < 0.01, and is statistically significant. The correlative equation of 3.7 × 107 Bq seeds was Y = 1.817 × 1.006x, R2 = 0.843, F = 1597.396, P = 0.000 < 0.01, and is statistically significant. Correlative curves between the dose and radioactive count value detected by SPECT/CT of every activity of 125I seeds are shown in [Figure 3]. This study demonstrates that SPECT/CT can be used to detect the radiation of 125I seeds in solid water. The relationship between the dose and the count value around 125I seeds was accurately revealed. This relationship can be used for brachytherapy dose verification of SPECT/CT-based 125I seeds. Although SPECT/CT-based dose verification still has a long way to go before it is ready for clinical use, there is a research curve, and the detecting precision and dose accuracy increase with more research data. In addition, SPECT/CT-based dosimetric verification is not restricted by having to know the seed activity, number, or location in the tumor. After SPECT/CT scans, the dose distribution can be visualized, and the dosimetric verification can be completed by computer automatically with fewer artificial errors. A CT-based postplan after seed implantation is the standard method of dose verification. Using this method, the seed activity, amount, and position implanted must be recognized precisely. However, in our clinical work, the activity of the seeds at different times and from different companies was different. Thereby, deviations in the activity of implanted seeds did exist. On the other hand, shifts of the source must be taken into account: Once shifted, the seed number in the tumor was not accurate.,,, In addition, CT image artifacts may cause single seeds to be imaged in two sections, and the existence of a seed overlap may increase the difficulty of precise recognition. Decreasing the errors in dosimetric verification, caused by the above reasons, will take a significant amount of time and work. However, a gap between CT-based dose calculations and the actual values still exists. Therefore, establishing a unified, objective, reproducible dose verification of 125I seed brachytherapy among centers is very difficult. This also restricts the development of dosimetry verification of brachytherapy. Our preliminary publication found that SPECT/CT can show the relative dose distribution very well in a prostate brachytherapy patient. However, the actual dose is still beyond our understanding, because the relationship between the count value and dose was not revealed. This study established the relationship between radioactive count values and doses preliminarily, which was the foundation of SPECT/CT-based dosimetric verification after brachytherapy. According to [Figure 2] and [Figure 3], whether fitting all data together or for each activity, all of the compound curves have good coherence. All of these formulas are in the form of Y = b0 (b1)x. In addition, all of these data revealed the internal relationship between the count value and dose. The formula of all activity Y = 2.489 × 1.006x may be suitable for the dosimetric verification of any activity. For clinical use, after being scanned by SPECT/CT, the images of SPECT and CT were fused. The dose of the target can be evaluated by checking the iso-count value line representing the prescribed dose (PD). If all images of the target are covered by the PD iso-count line, the dose distribution is good. If the target is not completely covered by the PD line, the dose is not sufficient, and more seeds need to be implanted. This method may be more objective and accurate. Some problems that cannot be resolved by traditional methods can be resolved easily in the future. SPECT/CT-based dosimetric verification might become a novel method for dose evaluation after brachytherapy. SPECT/CT-based dosimetric verification can solve the following problems: (1) the number and activity of seeds implanted do not need to be already known, the radiation emitted by the seeds is directly related to the number and activity of seeds, and the greater the activity and number, the more radiation detected, (2) the implanted seeds do not need to be picked up in the CT images. SPECT/CT can detect the radiation emitted by implanted seeds from the surface of the skin, and the accuracy is independent of seeds' position, (3) after SPECT/CT scanning, the dosimetric verification can be easily finished by a computer, and the dose can be visualized as well. There is a decrease in the consumption of time and work, and also in the number of artificial errors, and (4) the influencing factors such as seed activity, number, and position are considered to be negligible; therefore, this makes it possible for us to verify a dose that is caused by repeated brachytherapy. Challenges to the broader use of SPECT/CT-based dosimetric verification include perfect scanning parameters, accurate doses, and count value relationships. In an ideal state, the formulas of every activity will be in full accord. However, b0 of every formula has certain differences, and this may be caused by scanning, statistics, or small samples. To make the formula much more precise, the scanning and statistics should have a standard procedure, errors caused by operation should be eliminated, and the amount of the sample should be increased. In the meantime, some disadvantages also exist. First, the slice thickness of SPECT/CT scanning was 3.75 mm while the length of the 125I seeds was 4.5 mm, so the center of the seeds may not be detected easily. We need a further study to decrease the thickness of the slices. Second, this study was based on point sources, demonstrating the relationship between the dose and radioactive count, but it was constrained by the parameters of scanning, the positions of the seeds, specification of solid water, and so on. The derived formula is only applicable to the dose evaluation of single seeds under the parameters of this study. Further, dose-count relationship studies on many seeds in a line, in a plane, and in tridimensional distributions are necessary. Finally, the experiment results were obtained in an ideal condition by using a radiation oncology physics method, and there is still a great difference between a tissue-equivalent phantom and the human body. This formula cannot be applied to clinical dosimetric verification right now. In summary, radioactive counts do correlate with doses; SPECT/CT makes doses visible to us, and may provide a more accurate and more convenient method for dosimetric verification after brachytherapy. SPECT/CT-detection-based 125I seed brachytherapy dosimetric verification. Devlin PM. Brachytherapy: Applications and Techniques. 2nd ed. New York: Demos Medical; 2015. p. 79. Mohler JL, Armstrong AJ, Bahnson RR, D'Amico AV, Davis BJ, Eastham JA, et al. Prostate cancer, version 1.2016. J Natl Compr Canc Netw 2016;14:19-30. Sylvester JE, Grimm PD, Wong J, Galbreath RW, Merrick G, Blasko JC, et al. Fifteen-year biochemical relapse-free survival, cause-specific survival, and overall survival following I(125) prostate brachytherapy in clinically localized prostate cancer: Seattle experience. Int J Radiat Oncol Biol Phys 2011;81:376-81. Kickingereder P, Hamisch C, Suchorska B, Galldiks N, Visser-Vandewalle V, Goldbrunner R, et al. Low-dose rate stereotactic iodine-125 brachytherapy for the treatment of inoperable primary and recurrent glioblastoma: Single-center experience with 201 cases. J Neurooncol 2014;120:615-23. Liang Y, Wang Z, Zhang H, Gao Z, Zhao J, Sui A, et al. Three-dimensional-printed individual template-guided 125I seed implantation for the cervical lymph node metastasis: A dosimetric and security study. J Cancer Res Ther 2018;14:30-5. He C, Liu Y, Li Y, Yang L, Li YT, Li SL, et al. Efficacy and safety of computed tomography-guided 125I brachytherapy for lymph node metastatic from hepatocellular carcinoma. J Cancer Res Ther 2018;14:754-9. Xiang Z, Li G, Liu Z, Huang J, Zhong Z, Sun L, et al. 125I brachytherapy in locally advanced nonsmall cell lung cancer after progression of concurrent radiochemotherapy. Medicine (Baltimore) 2015;94:e2249. Hongtao Z, Xuemin D, Huimin Y, Zeyang W, Lijuan Z, Jinxin Z, et al. Dosimetry study of three-dimensional print template-guided precision 125I seed implantation. J Cancer Res Ther 2016;12:C159-C165. Nath R, Bice WS, Butler WM, Chen Z, Meigooni AS, Narayana V, et al. AAPM recommendations on dose prescription and reporting methods for permanent interstitial brachytherapy for prostate cancer: Report of task group 137. Med Phys 2009;36:5310-22. Devlin PM. Brachytherapy: Applications and Techniques. 2nd ed. New York: Demos Medical. 2015. p. 102. De Brabandere M, Hoskin P, Haustermans K, Van den Heuvel F, Siebert FA. Prostate post-implant dosimetry: Interobserver variability in seed localisation, contouring and fusion. Radiother Oncol 2012;104:192-8. Shiraishi Y, Yamada Y, Tanaka T, Eriguchi T, Nishimura S, Yoshida K, et al. Single-energy metal artifact reduction in postimplant computed tomography for I-125 prostate brachytherapy: Impact on seed identification. Brachytherapy 2016;15:768-73. Sutherland JG, Furutani KM, Garces YI, Thomson RM. Model-based dose calculations for (125) I lung brachytherapy. Med Phys 2012;39:4365-77. Xu C, Verhaegen F, Laurendeau D, Enger SA, Beaulieu L. An algorithm for efficient metal artifact reductions in permanent seed. Med Phys 2011;38:47-56. El-Bared N, Sebbag N, Béliveau-Nadeau D, Hervieux Y, Larouche R, Taussky D, et al. Seed loss in prostate brachytherapy: Operator dependency and impact on dosimetry. Strahlenther Onkol 2016;192:305-11. Ellis RJ, Zhou H, Kaminsky DA, Fu P, Kim EY, Sodee DB, et al. Rectal morbidity after permanent prostate brachytherapy with dose escalation to biologic target volumes identified by SPECT/CT fusion. Brachytherapy 2007;6:149-56. Ogata Y, Nakahara T, Ode K, Matsusaka Y, Katagiri M, Iwabuchi Y, et al. 3D SPECT/CT fusion using image data projection of bone SPECT onto 3D volume-rendered CT images: Feasibility and clinical impact in the diagnosis of bone metastasis. Ann Nucl Med 2017;31:304-14. Kono Y, Kubota K, Mitsumoto T, Tanaka A, Ishibashi A, Kobayashi K, et al. Scintigraphic detection of 125I seeds after permanent brachytherapy for prostate cancer. J Nucl Med 2008;49:541-5. Wang J, Zhang H, Zhao X, Yu H. The relationship between SPECT/CT with radioactivity uptake count value and dose of (125)I radioactive seeds. Int J Radiat Oncol Biol Phys 2016;96:E610-1. Nath R, Anderson LL, Luxton G, Weaver KA, Williamson JF, Meigooni AS, et al. Dosimetry of interstitial brachytherapy sources: Recommendations of the AAPM radiation therapy committee task group no 43. American association of physicists in medicine. Med Phys 1995;22:209-34. Meng J, Zhang J, Zhuang QW, Wang X, Li ZP, Gu QP, et al. TPS-guided interstitial iodine-125 implantation in patients with oral cavity and maxillofacial carcinomas. Eur Rev Med Pharmacol Sci 2014;18:2803-7. Davis BJ, Pfeifer EA, Wilson TM, King BF, Eshleman JS, Pisansky TM, et al. Prostate brachytherapy seed migration to the right ventricle found at autopsy following acute cardiac dysrhythmia. J Urol 2000;164:1661. Davis BJ, Bresnahan JF, Stafford SL, Karon BL, King BF, Wilson TM, et al. Prostate brachytherapy seed migration to a coronary artery found during angiography. J Urol 2002;168:1103. Zhu AX, Wallner KE, Frivold GP, Ferry D, Jutzy KR, Foster GP, et al. Prostate brachytherapy seed migration to the right coronary artery associated with an acute myocardial infarction. Brachytherapy 2006;5:262-5. Zhang H, Zhao X, Wang J, Yu H, Sui A. Dose distribution detected by SPECT/CT in a patient with prostate cancer treated with 125I seeds: A case report. Brachytherapy 2016;15:S183-4.